Over 100 students responded to the gospel at a UCCF city-wide student mission entitled ‘Rumour Has It’. 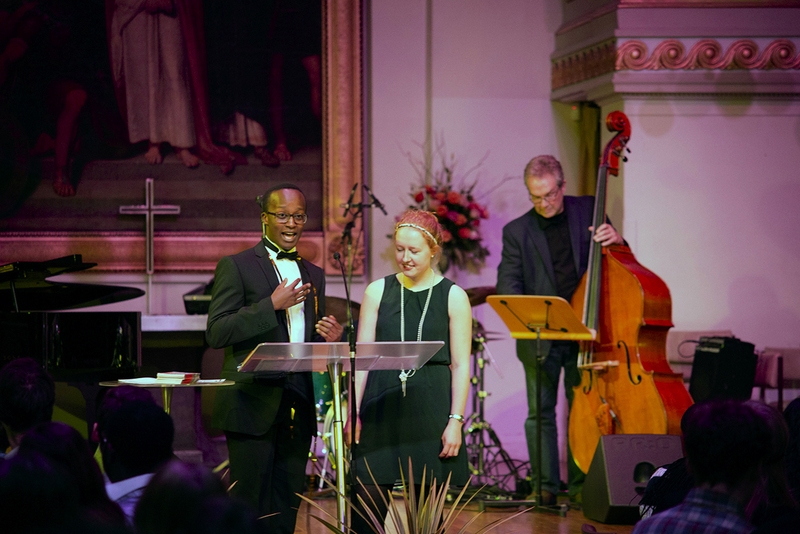 The Prohibition Era-themed week of events, which took place in late January, saw around 20 CUs from across London team up with 15 churches to put on a week of evangelistic events. Students dressed up in 1920s jazz/Great Gatsby-style costumes and served (non-alcoholic) drinks. The Bill Edgar Trio provided music and entertainment for a jazz café. Bill is not only a great pianist but also Professor of Apologetics at Westminster Theological Seminary, Philadelphia. The gospel was preached by UCCF director, Richard Cunningham. Around 300 students came to All Souls Church, the central London venue, each evening, with many more attending local campus-based lunchtime dialogues. London UCCF team leader, Natasha Kasprowicz, said: ‘There was a huge crowd on the opening night, many of whom were non-CU members. The team worked hard to make the venue a creative space and there was a wonderfully engaged and energetic atmosphere throughout the night. There was a standing ovation for the Bill Edgar Trio, who were fantastic – really powerful and moving. Richard invited students to fill in a feedback form which includes the opportunity to indicate “Count Me In” or “Tell Me More”. We had received about 75 response slips after the first two evenings, and a further 28 responded on the final night’. Natasha continued: ‘There was an electric atmosphere in the room as Richard spoke about the cross and as he and Bill Edgar engaged with students’ questions in the Q & A session. We were overwhelmed by the number of questions we received and it is clear that a number of students are thinking very seriously about what they’ve heard’. Freddie, a CU member from Ravensbourne, has been reading the Uncover Seeker Bible Study material with a friend. Freddie invited him (with seven others) to the ‘Rumour Has It’ events. On the final night, the friend responded by indicating ‘Count Me In’ on the feedback form. St Mary’s CU had their largest-ever lunchtime event, with 15 people coming along (the CU is tiny). A CU member’s room-mate said: ‘I would call myself an agnostic/atheist, but today has definitely opened my mind to [another] possibility!’. Of the opening night, Richard Cunningham commented: ‘Tonight was remarkable – huge crowds of unbelievers, energy, creativity, a standing ovation for the Bill Edgar Trio and great listening to the gospel.’ One attendee exclaimed: ‘I’m crying my eyes out! She [Ruth Naomi Floyd] sings so powerfully’. Ashley George, a UCCF Christian Union staff worker, said: ‘I sat next to the president of the Atheist Humanist Society at a lunch bar today. He is keen to read Uncover, so it looks like he’ll be reading with the CU president’. Natasha concluded: ‘More than 100 students have indicated over the course of the week that they want to know Jesus, or want to find out more. This number does not include any who have indicated that they want to find out more during the local daytime events. One of the girls who spoke with Richard has been a churchgoer, CU member and part of a Bible study group. She became a Christian yesterday’. The Bill to allow Belgian children of all ages to access euthanasia is being opposed by people all across Europe, via a petition organised just hours after the Bill was voted through in mid-February. Although there are concerns that it will produce a constitutional crisis if the Bill isn’t signed by the Belgian monarch, the aim of the petition is to protect the vulnerable. On February 11, 25 Protestant families had their water and electricity supplies disconnected and were effectively put under house arrest, because of their refusal to participate in traditionalist Catholic religious ceremonies. One person was arbitrarily detained by village authorities and imprisoned for more than 24 hours after he attempted to reconnect his water while under the supervision of state officials and police. This follows an escalation of discriminatory behaviour towards the group of Protestant Christians since 2010. The website ‘Looking for God’ has registered its two millionth unique visitor in February. ‘Unique’ means that even if an individual visits the website several times it only counts as one visitor. The official population of Poland is 38 million and the figure gives some indication of the effectiveness of this medium for reaching people. Anglican update: Complementarian is Arian? The Church of England’s governance is more democratic than many would have you believe. No significant change to the liturgy of the Church of England can take place without the approval of a majority of the 44 diocesan synods. But the system is complex; representatives to diocesan synods are elected from the deanery synod representatives, who are, in turn, elected by their congregation. This complexity is one of the reasons that evangelicals tend to be under-represented in the governing structures of the church. Over the next two months every diocesan synod will vote on the latest legislation to enable women to become bishops. Those pushing for this innovation are claiming that we have found the answer. They assert that the legislation is simpler than the package that failed in November 2012 and it will encourage a spirit of trust that will allow all to flourish. So it is ironic that, as the diocesan debates begin, we find increasing hostility towards those who hold firmly to a complementarian view of gender. Despite all these fine words about ‘flourishing’ and ‘trust’, the facts on the ground tell a different story. At the Sheffield diocesan synod in March the Dean of the Cathedral summed up the debate by asserting that the complementarian view of the inter-relationship between the divine persons of the Holy Trinity goes against the Church of England’s Thirty-Nine Articles of Religion. In other words, it is un-Anglican to believe in headship. No opportunity was given for a complementarian to reject this charge of heresy and the vote simply proceeded on the basis of the Dean’s remarks. It is a serious matter to report such division in the church, but I do it not just for the benefit of Anglicans but because this is the charge of more liberally-minded theologians from all denominations. The Dean is obviously not the first to allude to the idea that a complementarian view of gender leads to an Arian-style heresy and it would seem he is unlikely to be the last. As the debate about women’s roles in church becomes a debate about the nature of the Trinity, we can no longer see it as an issue of secondary importance. If our men and women are not to be blown off course by these accusations, then we need to prepare and equip them to understand and refute these arguments. The nature of the Trinity has always been challenging but, wonderfully, some excellent work has already been done by Bruce Ware*, Mike Ovey and others. Reform would be delighted to help any evangelical who is currently facing this challenge. Please pray that the increasing hostility in diocesan synods will actually open the door for courageous men and women to proclaim the wonderful truth that in the Godhead we see equality and difference worked out perfectly. * There is an excellent article in the EN archives by Bruce Ware called ‘Tampering with the Trinity’. Following a consultation of its members, the Royal College of General Practitioners (RCGP) will remain opposed to proposed changes to the law on assisted suicide, it was reported in February. 77% of the respondents to the consultation were opposed on account of the effects on the vulnerable, the problems implementing changes without coercion to die being possible and the ‘slippery slope’ nature of the proposals leading to no-consent deaths occurring. On February 11 the Welsh Assembly rejected an amendment to criminalise parents smacking their child. Assembly members voted 39 to 14, with one Assembly member abstaining. However, Deputy Minister Gwenda Thomas said: ‘There will be an opportunity to examine these issues in forthcoming legislation in this Assembly term’. The issue of criminalising smacking is likely to return to the Welsh Assembly before the 2016 election. Northern Ireland’s national football team will be forced to play an international match at home on a Sunday for the ﬁrst time, for a Euro 2016 qualiﬁer, it was reported at the end of February. The news has received widespread criticism, with some urging the Irish Football Association to challenge the decision. Previously, countries have decided their own fixture schedules, but not since an electronic selection process was introduced. Editors commentary: Too much of a good thing? For many years now there has been a self-satisfied smirk from anti-smacking pressure groups against those of us who believe, as the Bible tells us, that a ‘potch’ (Yiddish for a mild but suitably painful slap on the backside, delivered out of love and concern) ought to be among a parent’s options in disciplining our children. ‘Positive parenting’, which eschews all such techniques and beamingly suggests that children only ever need encouragement, is made out to be so right and the use of a smack met with a supercilious ‘we don’t do violence in our house’. Even Christian parents have bought into this seemingly ‘more loving’ way of doing things. However, the smile is beginning to prove false for ‘positive parenting’. The area of discipline in parenting is sensitive and complicated and I can’t get into detail here, except to recommend that before those who disagree with ‘tough love’ leap to their computer keyboards to fire off a riposte, they take the time to have a good look at the 2009 book The Spoilt Generation: why restoring authority will make our children and society happier. It is by researcher Dr Aric Sigman, and although he is a non-religious academic who ‘has not so much as had tea with a vicar’, he comes to the conclusion of Proverbs 13.24, that loving parents discipline their children when it is needed and not to do so is to ‘hate’ them. As ‘professional’ bodies, indoctrinated with political correctness and therapy culture attitudes, currently press parents not to do anything that might make a child cry, it seems that God is rather different. Taking his cue from the book of Proverbs the writer to the Hebrews explains to us why the Christian life can never be easy. God uses the circumstances of our lives and even persecution to ‘discipline us for our good, that we may share his holiness’. We are reminded that ‘no discipline seems pleasant at the time, but painful’ (Hebrews 12.4-12). And think of Jesus. ‘How could a God who strikes his Son as a penal substitute upon the cross in his service possibly be worthy of our allegiance?’ If I’m not mistaken ‘positive parenting’ could, if taken into the evangelical camp, easily become a Trojan horse to undermine belief in central matters of the gospel. We won’t be smiling then. This article was first published in the April 2014 issue of Evangelicals Now. For more news, artciles or reviews, subscribe to EN or contact us for more information. 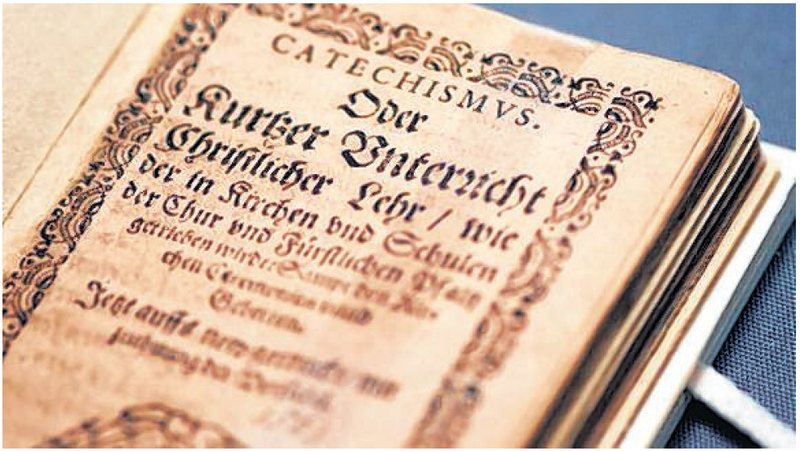 Of all the 16th-century confessions and catechisms, the Heidelberg Catechism is still the most widely used and the most beloved. A: That I, with body and soul, both in life and in death, am not my own, but belong to my faithful Saviour Jesus Christ, who with his precious blood has fully satisfied for all my sins, and redeemed me from all the power of the devil; and so preserves me that without the will of my Father in heaven not a hair can fall from my head; indeed, that all things must work together for my salvation. Wherefore, by his Holy Spirit, he also assures me of eternal life, and makes me heartily willing and ready from now on to live unto him. What is so memorable about this catechism as we celebrate the 450th anniversary of its publication this year? In the middle of the 16th century, the Reformation reached the Palatinate, a large province in the South of Germany. Soon strife broke out among the different Protestant streams — those who considered themselves the only true successors of Martin Luther (the ‘Gnesio-Lutherans’), those who were followers of the more moderate Philip Melanchthon (the ‘Philippists’) and those who were influenced by Calvin‘s Geneva and it‘s theology and practices (the ‘Calvinists’). In 1559, Frederick III became elector (ruler) of the Palatinate and was therefore one of seven responsible for calling the Holy Roman Emperor. Initially not very pious, he was won over to the Reformation faith by his wife, a devout Lutheran. When he commenced his reign, he sought both the political and spiritual welfare of his subjects. And he did so by seeking to unite the Protestant parties by way of a powerful common confession of faith — the Catechism, which he commissioned in 1562. In the Preface to the catechism (later known as the ‘Heidelberg Catechism’), he writes that he is ‘bound by the admonition of the divine word, and also by natural duty and relation’ and therefore has ‘determined to order and administer our office, calling, and government, not only for the promotion and maintenance of quiet and peaceable living, and for the support of an upright and virtuous walk and behaviour among our subjects, but also and above all, constantly to admonish and lead them to devout knowledge and fear of the Almighty and his holy word of salvation’. By the time he commissioned the catechism, Frederick III was a deeply godly man. This gained him the name Frederick ‘the Pious’. He was concerned for the spiritual condition of his subjects. During the many theological debates in Heidelberg and elsewhere during the 1550s and 60s, Frederick was eventually — to the disapproval of his still Lutheran wife — convinced of a Reformed view of the Lord‘s Supper and other core doctrines. Thus he started his reform movement by drafting Reformed theologians to serve as professors at the influential university in Heidelberg. Two of the most gifted pastors and theologians were Zacharius Ursinus (1534Ð1583) and Caspar Olevianus (1536Ð1587). Especially Ursinus had already written catechetical works, such as a larger catechism for theology students and a shorter catechism for the laity. In 1562, then, Frederick gathered a team of theologians and pastors to produce a new catechism that would serve as ‘a summary course of instruction or catechism of our Christian religion, according to the word of God, in the German and Latin languages; in order not only that the youth in churches and schools may be piously instructed in such Christian doctrine, and be thoroughly trained therein, but also that the pastors and schoolmasters themselves may be provided with a fixed form and model by which to regulate the instruction of youth, and not, at their option, adopt daily changes, or introduce erroneous doctrine’ (Preface of 1563). The message of the Heidelberg Catechism is foremost a message of comfort. In a time of political and spiritual unrest and of death being ubiquitous, comfort is what people needed. However, the Heidelberg Catechism is by no means man-centred. Rather, anyone who studies it will readily see what is meant by that comfort — nothing but the gospel. Q: How many things are necessary for you to know, that in this comfort you may live and die happily? A: Three things: First, the greatness of my sin and misery. Second, how I am redeemed from all my sins and misery. Third, how I am to be thankful to God for such redemption. It is this starting point — the misery of our sinfulness and lost estate (part 1 of the Catechism) — that makes us long for a true, biblical comfort, the comfort of the gospel (part 2). The faith the Heidelberg Catechism expounds is not an esoteric faith. Not once are the words ‘Reformed’ or ‘Calvinistic’ mentioned. It is, rather, ‘our catholic, undoubted Christian faith’ (Q. 22). True faith is defined as ‘not only a sure knowledge whereby I hold for truth all that God has revealed to us in his Word, but also a hearty trust, which the Holy Spirit works in me by the Gospel, that not only to others, but to me also, forgiveness of sins, everlasting righteousness, and salvation are freely given by God, merely of grace, only for the sake of Christ’s merits’ (Q. 21). A: Only by true faith in Jesus Christ: that is, although my conscience accuses me, that I have grievously sinned against all the commandments of God, and have never kept any of them, and am still prone always to all evil; yet God, without any merit of mine, of mere grace, grants and imputes to me the perfect satisfaction, righteousness, and holiness of Christ, as if I had never committed nor had any sins, and had myself accomplished all the obedience which Christ has fulfilled for me; if only I accept such benefit with a believing heart. I have already pointed out the intuitive and biblical structure of the Catechism, sometimes summarised according to its three parts: guilt, grace, and gratitude. What is intriguing about the structure of the catechism at this point is that it reflects a certain view of the total Christian life. The three-part structure of the Catechism is less a ‘pattern of conversion’ — realising your sin once, coming to Christ initially and decisively, and following Christ — than it is a pattern of the entire Christian life. The Christian knows all parts of the Catechism and experiences all of them continuously. The mirror of the law that drives him to Christ, the gospel in all its glory and grace, and the obedient life that flows from it. It is worth noting that the Heidelberg Catechism places the discussion of the law under the heading of part 3 — gratitude! Thus, it is clear from the outset that obeying God‘s law is not and can never be a way to Christ, but rather is the fruit of belonging to Christ by faith alone. Personal pronouns are employed throughout the Catechism. They serve to build up the personal faith and assurance of God’s people. Christ not only delivers sinners (through faith) in general, he has delivered me from my sin with his precious blood. Sometimes people wonder if the Heidelberg Catechism is still answering the questions that people are asking. I, for one, am convinced that it does — and if it does not, then people may just be asking the wrong questions. I know no better manual of the Christian faith and the Christian life. Sebastian Heck is minister of SelbstŠndige evangelisch-reformierte Kirche Heidelberg (Free Reformed Church Heidelberg) in Germany and co-editor of the recently published A Faith worth teaching: The Heidelberg Catechism’s enduring heritage (Reformation Heritage Books, 2013). A few highlights to look forward to in the April issue of EN! It’s scheduled to arrive from the printers on Friday March 21. 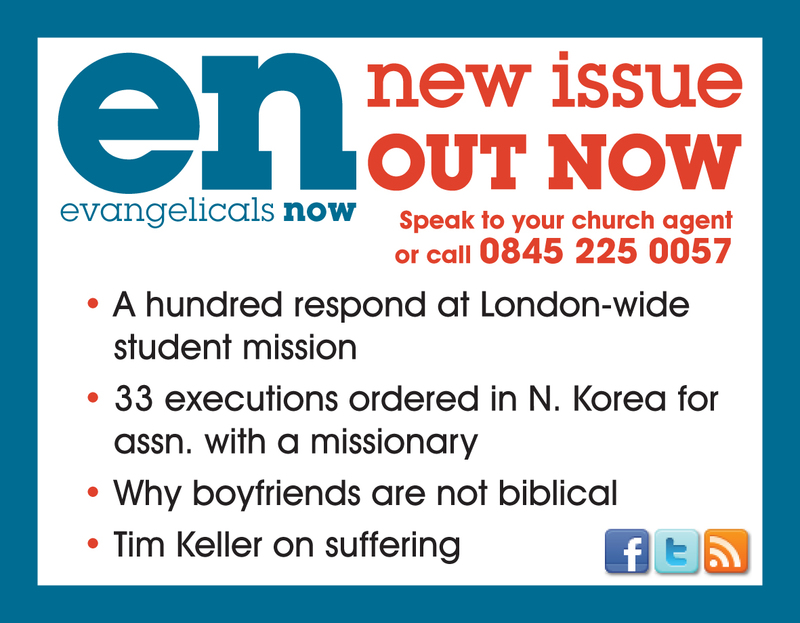 Of course you can always e-mail subs@e-n.org.uk as well if you’d like a complimentary copy or if you’d like to subscribe!